I have measured the spectral response of three camcorders. DV Transfer function and camera light transfer curve. Audio level measurements. Audio noise measurements. One user contributed these measurements of Video Bandwidth of TRV900 compared to BetaSP and some other devices. 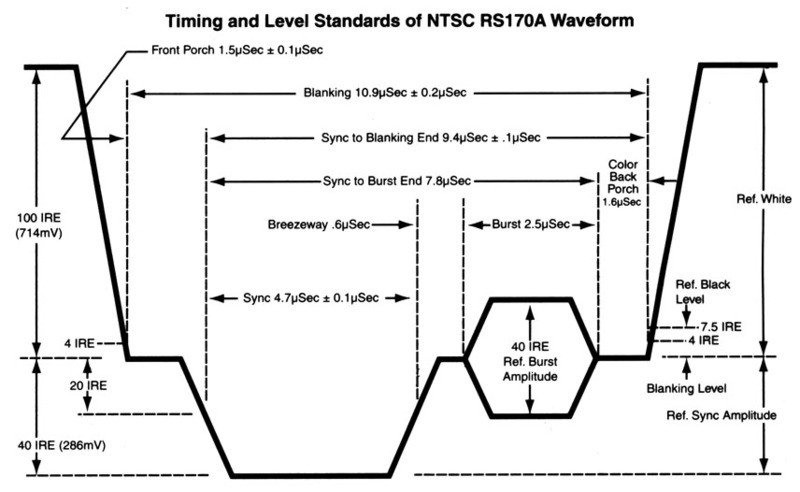 NTSC RS170A Timing from manual for NewTek Calibar, a compact video signal generator. The color video signal standard used in the USA is called RS170A. The nominal baseband composite video signal has an amplitude of 1.0 Vpp. Video levels are conventionally measured in IRE units, where zero IRE (0 mV) is defined as the "blanking level" (see illustration above). The sync pulse extends to -40 IRE (-286 mV), and full white goes to +100 IRE (+714 mV). Knowing that 1.0 V = 140 IRE, and thus 1 IRE = (1/140) = 7.143 mV lets us use a normal oscilloscope as a waveform monitor. 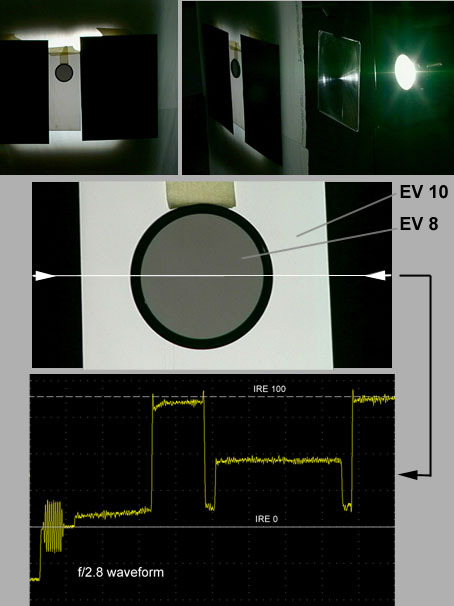 In the image portion after the blanking interval, the level of the video signal is proportional to image brightness, and should fall into the range of 7.5 IRE (black) to 100 IRE (full white). Tektronix's web site has some useful information about video measurements if you need more details. I do not have a waveform monitor or a vectorscope, but I do have a regular oscilloscope. 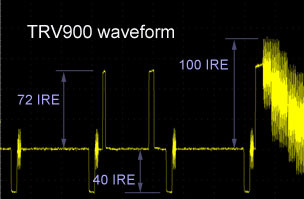 The measurements below were made with a Tektronix TDS210 digital scope (60 MHz bandwidth, 1 GHz sample rate) connected to the composite output of the TRV900, with a 75 ohm load at the scope end. The data from the scope was uploaded directly to my PC, I didn't photograph the screen. 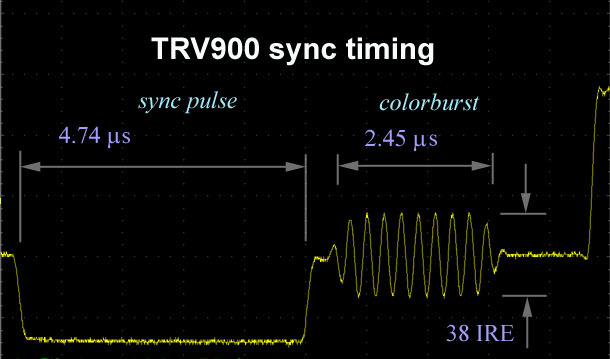 My measurements indicate that the TRV900 composite output is very close to the nominal video standard signal, as you would expect. The first image shows the white references pulses just before the start of a field. The measured amplitudes are as indicated. The second image shows the sync pulse and color burst signal before the start of a scan line. Here is a picture of the internally-generated color bars, which matches the standard NTSC color bar pattern very well. The NTSC standard specifies that the black level ("setup") is different from the blanking level. Specifically, blanking is 0 IRE and setup is 7.5 IRE. Apparently many Japanese video cameras use a setup of 0 IRE. Looking at the video signal with the shutter closed and the lens cap on, I measure my TRV to have a non-zero, but very small setup: about 3.6 IRE. Dynamic range: I wanted to see what range of intensity the camera could measure. I arranged a test target with a uniformly lit diffuser and a ND filter in the middle which cut down the light by approximately 1.75 stops (transmitted light reduced by 70%). Based on readings with my 35mm camera light meter (accurate only to 0.5 stop or 25%) I measured the brightness of the two areas on my test target to be EV 10 (same as 5500 lux on 18% grey target) and EV8 (1400 lux on 18% grey). I then measured the output waveform IRE level in the two regions at various f-stop apertures on the TRV900 (using normal 1/60 sec interlaced scan, 0 dB gain). At f/2.8 the zebra stripes (100 IRE) were just starting to cover the brighter target area. My results are shown in the table below. I observe that the ratio in IRE readings between dark and light areas is near 2:1 at all ranges, but is greatest at the f/4 setting. Based on these measurements, I conclude that the range in intensity between 9.6 IRE and 95 IRE is almost 6 f-stops, or a contrast ratio of about 50:1. I have measured the DV Transfer Curve from digital pixel values to analog output levels for the TRV900 and TR7000 cameras, and also the light transfer curve. I used a signal generator, mixer, oscilloscope, and attenuator to measure the mic input characteristics with the AGC on (that is, auto level, not manual audio level control). "Mic Input" values are after the 40 dB attenuator; that is, the actual RMS signal going into the mic input. This was all done live, not in playback, but I assume it would be the same in playback. The volume control is done with AGC, not a compressor or limiter; the sinewave stays undistorted right up to clipping at 42 mVrms in. When the input signal increases, the AGC is very fast; on a 20 dB step decrease in signal, the gain ramps up over 4 seconds. I also measured this audio data for the Sony TR7000 Digital 8 camera; the values are identical within measurement error. If you are powering the camera from the line, and also running a mixer into the mic input, watch out for ground loops which can cause a 60 Hz buzz on your audio. On the high end, it is about 6 dB down at 20 kHz (according to the digital scope- turns out my hearing drops to nothing even before 15 kHz.) On the low end, less than 3dB down at 10 Hz and about 5 dB down at 5 Hz. All this is in 16 bit audio mode. The level measurements were done using a 1 kHz sine wave input to both L and R channels (through XLR-Pro adaptor in mono mode), and a digital scope to measure output levels from the A/V jack. It looks to me like the "tone" recorded at about -12 dBfs (the fourier transform was taken over several seconds of data, so the level fluctuations are averaged). The average signal power is -12.0 dB (Left) and -8.3 dB (Right) RMS. The "silence" looks to have most energy at 60 Hz (-64 dB) and 120 Hz (-72 dB), and a -78 dB at the 15.7 kHz horizontal retrace frequency. Total average noise power is -58.2 dB (Left) and -57.8 dB (right) average RMS power, dominated by the 60 Hz frequency. After applying a filter to notch out 60 and 120 Hz from the noise, I got -60 dB average total power. If broadband noise is at -60 dB and your average peaks are at -12 dB, you have a 48 dB SNR. By contrast, I measured my Sharp MD-MS702 MD recorder to have 81 dB SNR (or 69 dB if you want 12 dB headroom), using line-in and headphone playback (notes here). If you want to measure noise the way your ear hears it, you need a weighting filter. The ear is much less sensitive to low and very high frequencies. For those interested, here is the shape of the "A" weighting filter, used to approximate the response of a supposed standard human hearing. I made this table based on the equation at msaxon.com. Relative to the response at 1.0 kHz, this weighting curve is down by 33 dB at 50 Hz, down 10 dB at 20 kHz and enhanced 1.4 dB at 2 kHz.